Founded in 2002, jBilling provides services to clients such as ConstantContact, VeriFone and Sage, according to our source article fromTechCrunch. AppDirect co-CEO Daniel Saks said his company will continueto sell and support existing jBilling products. According to the news release announcing the acquisition, jBillingprocesses more than 10 million invoices each month and has racked upmore than 120,000 downloads in more than 150 countries todate. 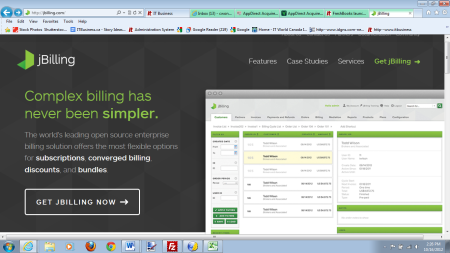 Screenshot of the jBilling homepage. AppDirect, founded in 2009, is based in San Francisco. It makes “whitelabel” software-as-a-service(SaaS) app stores. Many of its customers are IT consulting firms thatsell SaaS applications like Google Apps and Send Grid. The company hasraised almost $12 million in financing over the past year.